Who says dogs are only man’s best friends? These days a loyal canine can be a bride’s best friend, as well. The trend of including pups in a wedding ceremony has been on the rise. 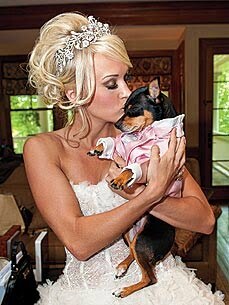 Embraced by celebrities such as Gisele Bundchen, Carrie Underwood, and Jennifer Hudson, puppy participation has created a whole new market for both the bridal and pet industries. Carrie chose a pink tux for her Min Pin, Ace. Ashlee Simpson and Pete Wentz included Pete's bulldog in their celebration. A bow tie collar gets Rebecca Romijn & Jerry O'Connell's puppy pal ready for their wedding. 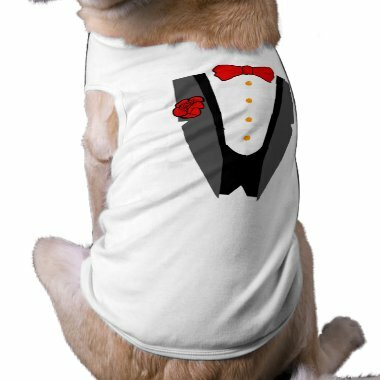 Whether you want your pup to be a bridesmaid, a groomsman, or simply an honored guest, there are plenty of wedding wardrobe options to get your canine companion dressed for the occasion.